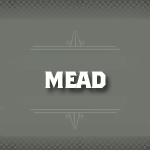 Mead is an alcoholic beverage created by fermenting honey with water and other ingredients such as fruits, grains, hops and spices. The alcohol content can range from 8% to over 20%. Mead may be still, carbonated, sparkling, dry, semi-sweet or sweet. The defining characteristic is that the main fermentable sugar is derived from honey.